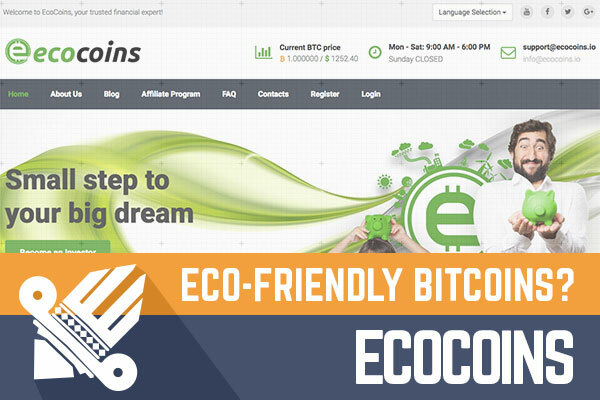 DavidNews HYIP blog - News & Reviews: EcoCoins - Eco-Friendly Bitcoins? EcoCoins is a Sticky listing project with $360 reinvestment what was added to DavidNews.com monitor on 25th of February. If you follow DavidNews daily, you know that yesterday I published an interview with the administrator from EcoCoins and to be honest even among several interviews in the past with other projects this one was one of the most saturated. If you would like to read interview click here, but for review just read further. From the first impression, I thought that project is about folks who grow vegetables in a greenhouse or produce biodegradable plastic, but when we take a deeper look, it turns out that it is bitcoin mining platform. At least legend claims so and to be honest I think that it is quite an interesting combination because we do not see much such type projects around. When we take a look at the design of EcoCoins than I would say that project is quite well looking but at the same time seems that administrator does not like too much textual content. One thing that I would like to praise this project is a custom script. It seems that script is entirely done for this project and I like to use it very much. The project offers three investment plans with quite poor returns, but at the same time maybe that is not that bad since that can help this project to be around us for some serious time. All investment plans are self-explanatory, and I must inform that it is possible to invest only with Bitcoin. I find it interesting that you can withdraw in a classic way that you simply press withdrawal button and your payment is sent, but you can also increase miners fee for Bitcoin withdrawals, and in such way, your payment will be confirmed in your Bitcoin wallet faster. Of course, take in mind that project is not fresh, it has been around more than 130 days, and you know that it might have last breath, but on the other hand it might continue in the same fashion. Of course, in any case, we can't know anything for sure because we do not know the mindset of the administrator, but in any case, if you invest than only what you can afford to lose. On Moon Bitcoin you can get FREE bitcoins. 514 satoshis every 24 hours. AvaHost is ultimately the best web-hosting company for any hosting plans you need. Did you ever try to automate your free BTC claims by using a BITCOIN FAUCET ROTATOR?